that quiet honestly, I’m just tired of. Rather than just getting rid of them, I’ll use them outside. 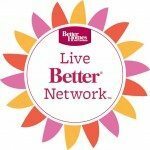 This is a sponsored post written by me on behalf of BHG at Walmart. All opinions are my own. It’s true, I rather be outside than inside. I had a blank patio to start with. While I was in Alabama visiting family, Barry picked up this patio set (we had already being eyeing it) and had it put together by the time I returned home. He even pressure washed the concrete. What a man! You may recognize most of the things you see here, they were at our old house. The candlesticks are Goodwill finds that I spruced up just for the patio. After taking inventory of the stuff that I shopped the house for, like this large outdoor print/painting that I scored from the clearance isle at Hobby Lobby years ago, I knew coral would be a great color to bring in to the space! 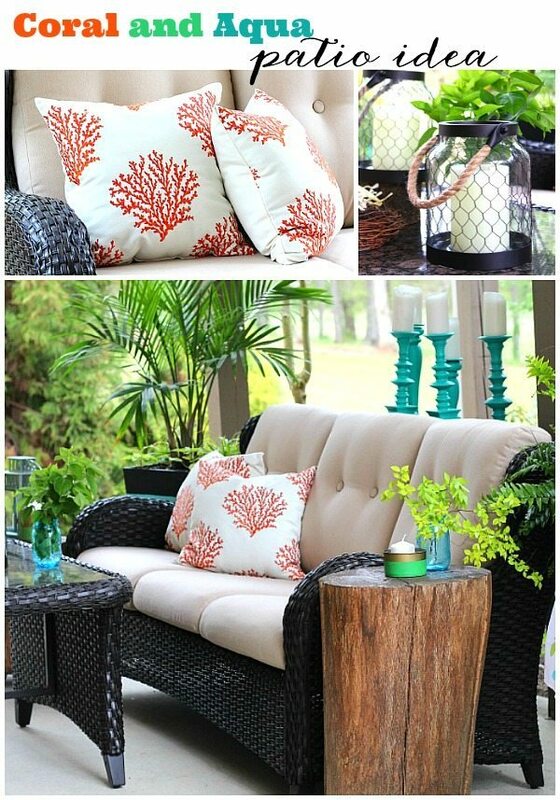 I found these Coral Reef indoor/outdoor pillows for only $13.97. The tree stump tables will live on forever, if I have anything to do with it. They add a little rustic element to every space that I’ve used them in. We’ve had the cooler on wheels forever, I just used the top of it as a buffet. I stacked my Galvanized Drink dispenser on top of an old minnow bucket. The height is great for getting glasses under the spigot. 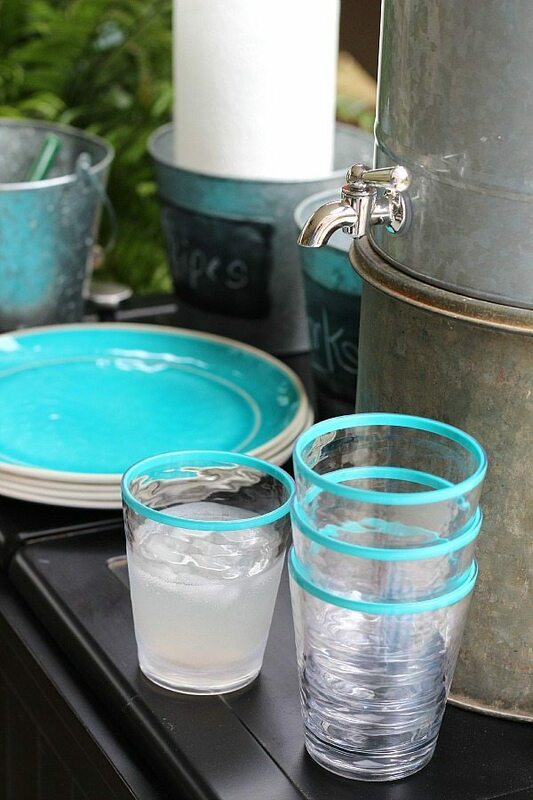 Keeping with my color story, these Aqua rim melamine cups and Aqua Watercolor plates . I guess it’s more of a color addiction, than story. I can’t help myself, I love aqua! 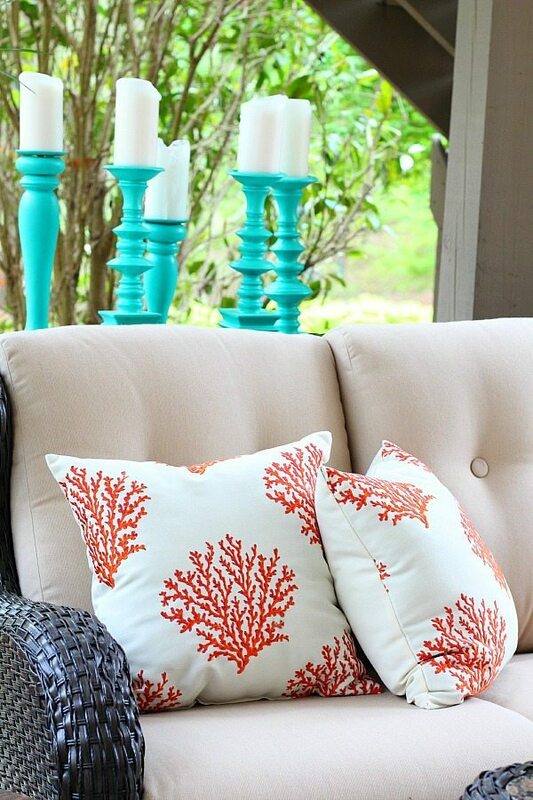 Aqua and Coral are a few of my favorite color combinations! 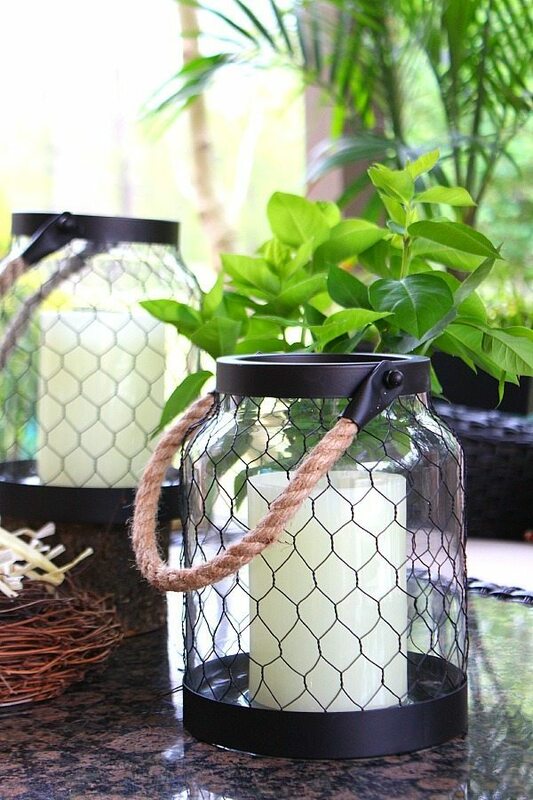 Chicken wire Rope Handled lanterns had my name all over them! I elevated one with a little tree stump. They really keep the space casual and speak my decorating style language. A little rustic farmhouse look. Let the cream cheese become room temperature. Mix fluff and cream cheese. Add vanilla flavoring, stir until smooth. This Clear serving tray is great for my fruit dip and fruit or you can use it for chips and salsa. I love having multi-use items. You may have noticed a few other things that I stumbled across at Walmart, like the aqua striped buckets, the chalkboard galvanized buckets – that I used to hold the silverware and paper towels. Crazy cute, right? Oh and the patio set is from Sam’s Club. Come on over and relax with me! I seriously love everything in this space. I’m going to have to pin every picture! By the way, we make that same fruit dip, only instead of the vanilla, I add one Tbsp. Orange juice and 1 teaspoon lemon juice with a sprinkle of ground ginger. I’ll have to try it your way sometime. Hi Debbie, I see you on Twitter all the time. 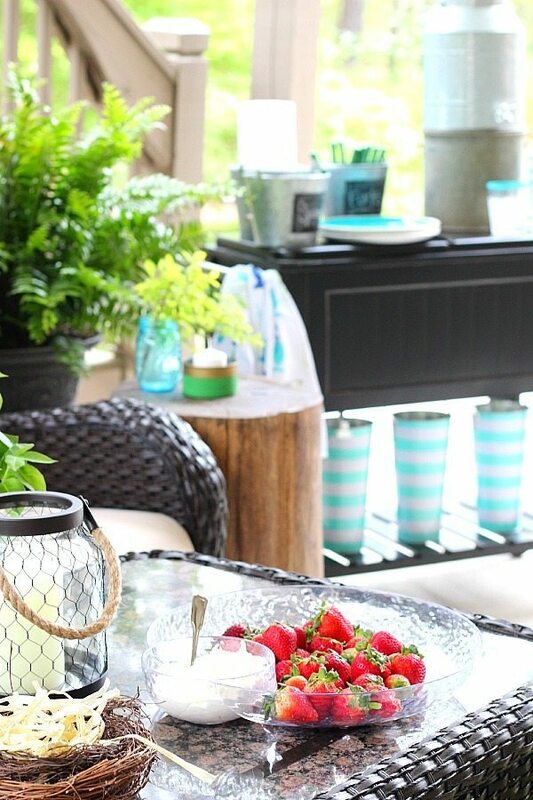 Love your outdoor space and little farmhouse rustic look. Thanks so much for joining our link party. Thank HomeGoods for hosting, I LOVE shopping at HomeGoods too! Great color combination. 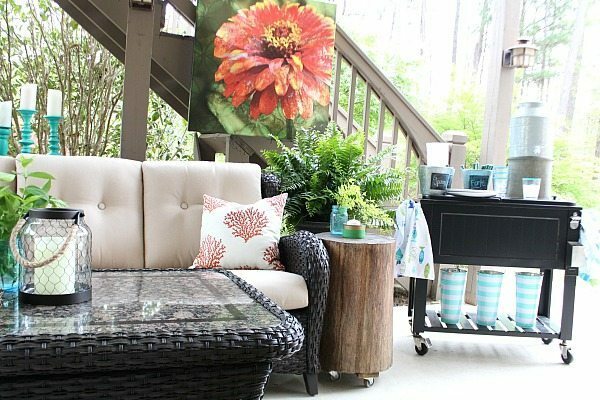 I need to add some things to my porch this summer and you gave me some great ideas! yum. i love that dip and your pretty patio. looking forward to sitting on it one day. 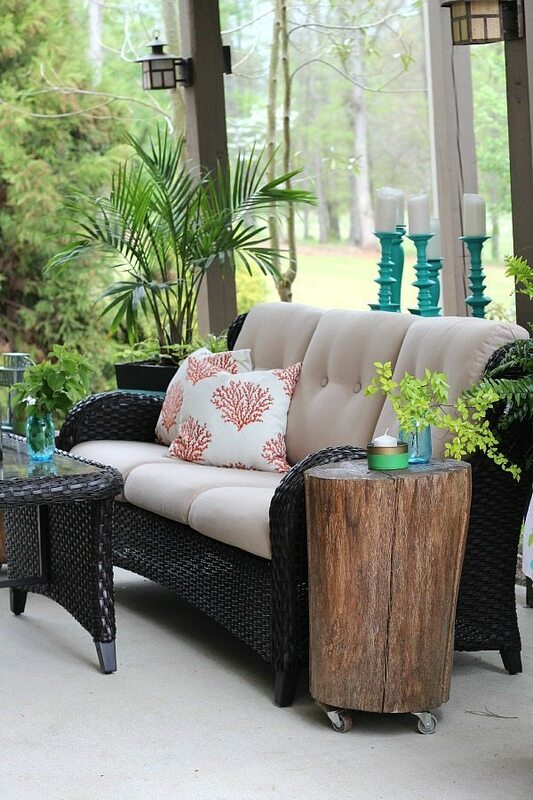 Debbie, your outdoor space is simply gorgeous! Aqua is my favorite too! Love this look!! 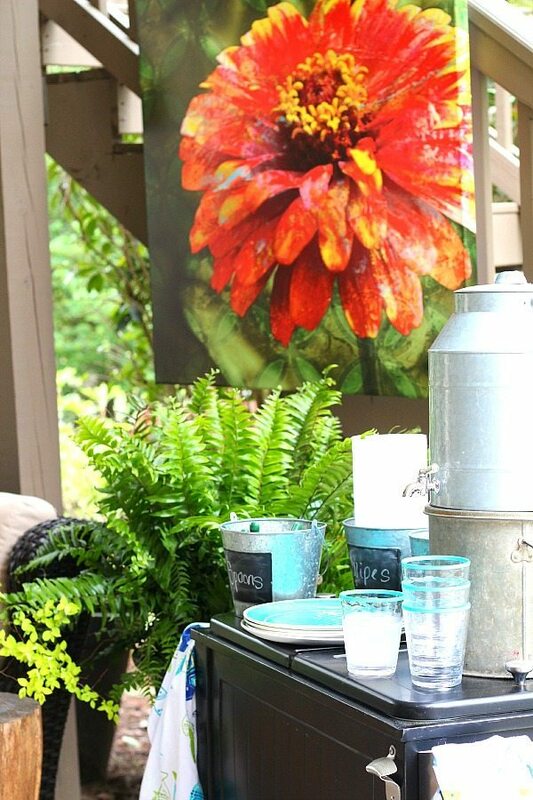 Everything looks so fresh and pretty!What a great idea to hang a picture outdoors. So cute!! 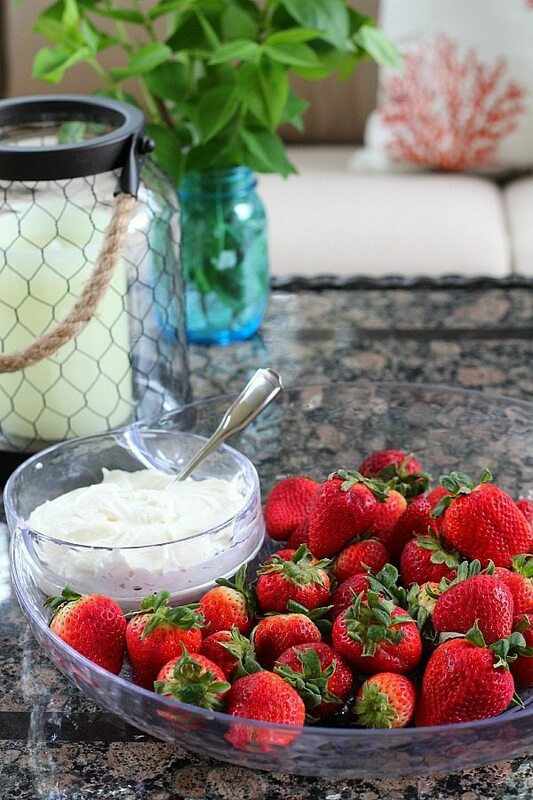 … and don’t get me started on that dip and berries… yum!! Come on over Shannon! Thank you!! Love the colors you used, so bright and refreshing! Will definitively try the fruit dressing! Thanks for sharing. I think you will love the dip 🙂 Thank you!! What a wonderful outdoor space! I love your patio set. aHH, i LOVE IT! 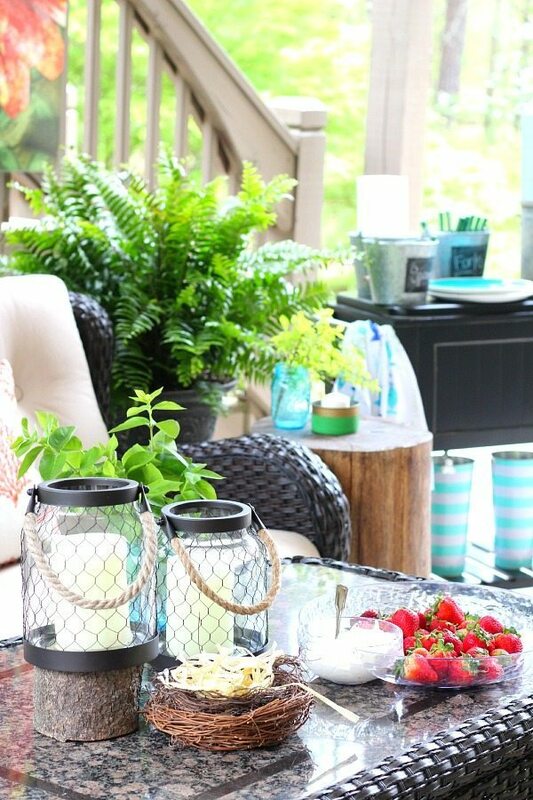 Our patio is aqua and black with some coral accents too! Enjoy! Thanks so much Kimm, sounds like we love the same colors! love your porch decor so much! thinking of you and sending you love. Thanks so much Cassie, I appreciate you so much!